Lots of sweat, a little bit of blood, and buckets of tears went into the new look of Hemmings Muscle Machines. Click on the image for a video of the photo shoot. 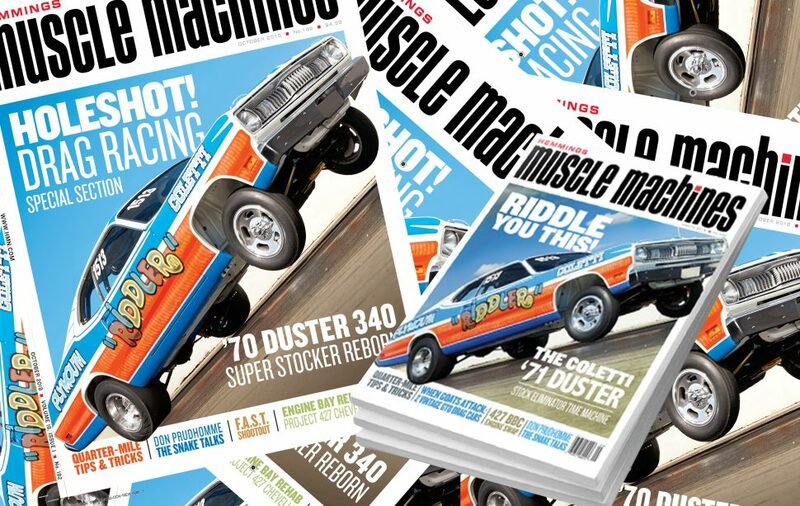 Hemmings Muscle Machines is starting to hit mailboxes and newsstands, and it’s got a new look. So, we figured it was time to pull back the rear doors of the race trailer and show you how we do what we do. One of the most common things we hear is, “Must be nice to just do photoshoots all day with rad cars and stuff…” And, yeah, we guess that’s true. But there’s a ton of work that goes into capturing (let alone processing!) every photo you see in your favorite muscle magazine, especially the one that will appear on the cover. So, here are a few choice moments from our shoot at Dragway 42 in West Salem, Ohio, with Dan Sukosd and his bitchin’ Coletti Riddler ’70 Plymouth Duster Super Stock drag car. Chris Osburn and Tom Roche of Roche Photo Collective, did the honors on this one. We had a blast and nothing broke. Mostly. Oh, and if you’re wondering about the year of this car: It’s a ’70 Duster, but it’s running a ’71 sharktooth grille because of the rules the Coletti team was taking advantage of back in the day.